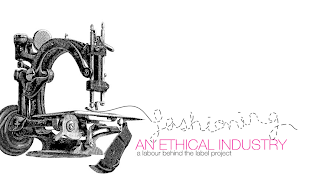 Last Wednesday I attended the Fashioning an Ethical Industry conference at The Rich Mix, London – a fitting venue being that it used to be an old garment factory. The conference was opened by director Hannah Higginson, who advised that global sourcing was the theme of the day bringing together speakers from all areas of the supply chain. The audience consisted of fashion, marketing and business students as well as industry experts and designers. You could feel the tension in the audience as these difficult issues were discussed and feel the genuine passion for fairer and more ethical approaches to be applied within the fashion industry. The speakers talked about the difficulties surrounding production methods, working conditions and global sourcing. There was a representative from ASDA who talked about their plan to be the number one retailer for women’s fashion in the UK by producing quick affordable fashion in an ethical way. A representative from People Tree talked about their grass roots approach to re-skill workers whom they refer to as artisans. They talked about their application of traditional handcraft and how it can take ten times longer to produce clothing but this is more sustainable as they eloquently referred to our hands being the oldest source of renewable energy. One of the most inspiring talks of the day was by Dr Kate Fletcher, reader in sustainable fashion and textiles at London College of Fashion. She talked about systems thinking and the complexity of the fashion industry. Kate advised that we should not look for and can not find one complete solution but instead seek out ways to inspire and initiate lots of small changes, as this can collectively inspire big change. The day closed with delegates being divided into three workshops focusing on design, marketing and business. In teams we were challenged to address an ethical fashion dilemma. I really enjoyed this part of they day as I got to meet new people who were passionate about fashion but committed to finding ethical ways to make, consumer or engage. Overall this was a great day I left feeling really inspired, more educated about ethical sourcing and I even made some new friends. The day offered a holistic view of the sustainable issues challenging the fashion industry and I think it motivated delegates to find small ways to contribute towards making a difference. Looks good to us - very nice to meet you.